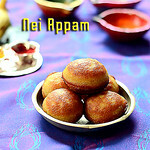 This is a traditional nei appam recipe without banana, wheat flour (Ghee appam). It is prepared by soaking and grinding raw rice, urad dal and toor dal but it can be made instantly without fermenting the batter. Karthigai Deepam festival has arrived. Just 4 days to go. For every food blogger, festival starts one week earlier than the actual day because we need to try varieties of neivedyam recipes for the sake of blogging. Sometimes I feel lazy to try out new recipes but whenever I get some mails of appreciation and recipe requests,I feel myself refreshed and start to browse for some interesting recipes.Yesterday I got a mail to share Nei appam recipe using rice. 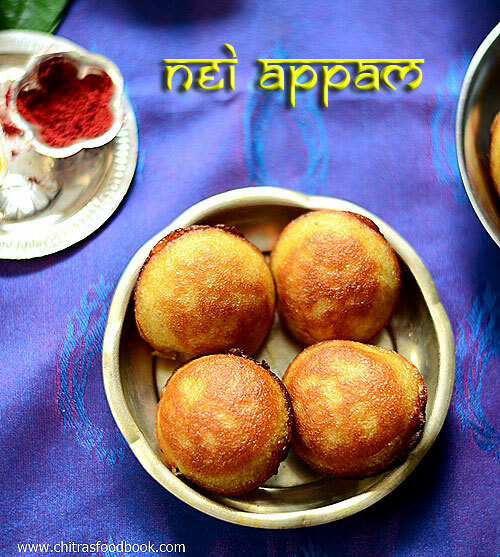 Even though I had posted an easy and instant nei appam recipe with rice flour, rava and wheat flour, that was not the traditional recipe.Traditionally nei appam is made using rice and it should be deep fried in ghee or oil. 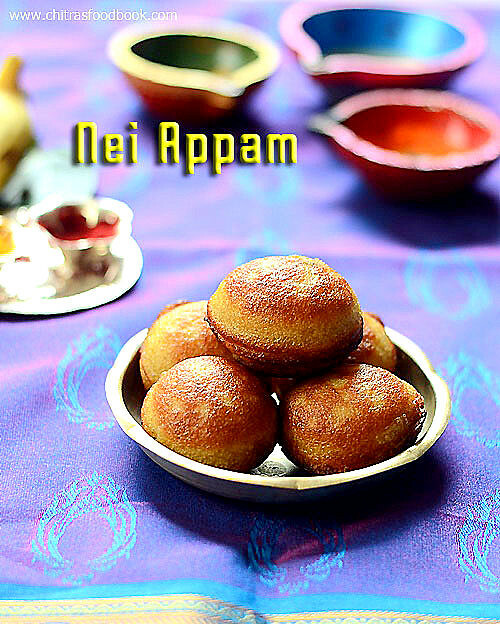 In Kerala,they call nei appam as unniappam. So this year for Karthigai deepam 2018, I wanted to share a nei appam recipe with rice as per my reader’s request.I adapted this recipe from my MIL’s sweet paniyaram recipe and I used my paniyaram pan to make this appam.So this is not a deep fried version. It came out very well and soft. The flavor of ghee & jaggery with cardamom was awesome. We all loved it. Friends,if you are looking for nei appam recipe with rice,do try this one.It needs 4-6 hours fermentation time based on the weather.For instant version,please click THIS LINK. For appam recipe using wheat flour,click THIS LINK. Next week I will try to share a sweet appam recipe using maida !Lets see how to make ghee appam/Vella appam recipe for Karthigai Deepam. Wash and soak rice,methi seeds,urad dal,toor dal and poha together for 2 hours.Grind it in a big sized mixie jar adding grated jaggery and cardamom.The batter should be very smooth.So add water accordingly.Do not make the batter too watery.It should be of dosa batter consistency.As we are adding jaggery while grinding,it will leave some water.So use water carefully. Remove the batter in a bowl and keep aside for 3-4 hours. Usually we grind the batter around 11am in the morning and make appam at night around 7.By doing this way,batter would be fermented slightly and gives soft appam.So soak the rice & grind the batter earlier at least 5-6 hours before making appam to get really soft appam. In the evening around 6pm,take the batter and mix it well.If you feel the batter is too thick,add some water to bring dosa batter consistency.Add 2 pinches of cooking soda,mix well and set aside for 10 minutes. Heat a paniyaram pan and add 1/2 tbsp of ghee in each hole.You can mix gingely oil + melted ghee and make this appam.When the ghee is heated,pour the appam using a small ladle.Fill the batter till half of each holes.This helps for even cooking. Keep the flame low and close the pan with a lid. After 2-3 minutes,flip the appam and cook the other side by covering the pan.Prick it with a fork for even cooking.Appam looks golden brown,bulgy and soft.Insert a toothpick or back of a spoon and check for doneness.If the spoon comes out clear,appam is done.This appam stays good for a day. ( color of appam may vary based on the color of jaggery.If the batter is well fermented,u will get nice golden colored appam as u see in the picture) Enjoy ! Do not use thick batter for making appam.Appam will become hard. You can add 2 tbsp of grated coconut while grinding the batter. This appam tastes the best when the batter is ground 6 hours before making.So try to make it earlier. If the batter is properly fermented,u can omit cooking soda. Sometimes my MIL adds a ladleful of fermented idli,dosa batter to avoid cooking soda. You can mix gingely oil + melted ghee and make this appam. 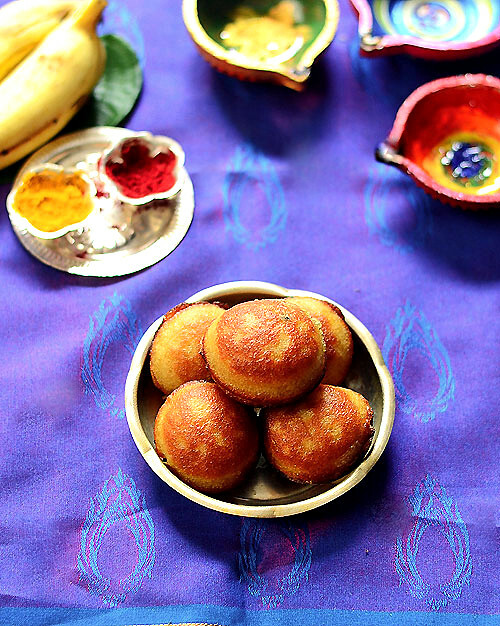 Try this traditional Nei appam recipe for this Karthigai Deepam and Enjoy ! I don't use cooking soda.. If avoiding that make the appam hard?